Imagine trying to speak Portuguese without using words like tipo, sabe, entende, ou seja and quer dizer. These little words are called discourse markers, and if you’re like most Brazilians you frequently use them while you speak in order to accentuate what you are saying, give yourself more time to think about what you will say next and to add a more natural flow to the conversation. You use discourse markers unconsciously when you speak Portuguese, but do you use them when you speak English? 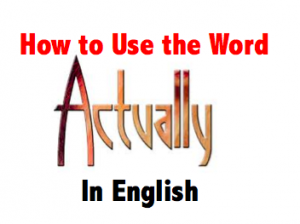 The word “actually” has several different uses in English and is very common in spoken language. As we will see, it is an important word to learn how to use because it allows you to change your mind about something that you say. Discourse markers are a topic that we will cover more in detail in the future. Sign up for our mailing list in order to receive updates for future articles. The inspiration for this article came from the book Como Dizer Tudo em Inglês. Perfect Josh! ! Do you have any more articles that I can ready and study?? Thank you! !